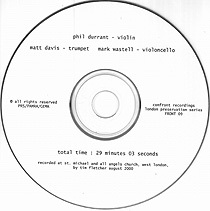 Phil Durrant, violin; Matt Davis, trumpet; Mark Wastell, cello. Recorded at St Michael and All Angels Church, London, in August 2000. Limited edition CDR release; "London Preservation Series".